As partners of the One World Berlin Film Festival, on November 27, 2010 American Voices Abroad Berlin and Ava’s Transatlantic Green Salon organized a discussion about the film “Gasland” (2010, Josh Fox), inviting gas market researcher Benjamin Scholz (Initiative für nachhaltige Entwicklung e.V.) to offer a closer – and critical – look at the topic of “unconventional gas”. Josh Fox’s literally explosive film “Gasland” gives voice to the bitter controversy surrounding “fracking”, an “unconventional” form of natural gas drilling that has swept the U.S. in recent years. In this technique, a mixture of water, sand and chemicals is pumped into rock formations that contain natural gas; according to critics, it poses a risk that groundwater may be contaminated by chemicals and released gas. An intelligent, oddball, blackly humorous polemic, the film mixes apocalyptic landscapes and scientific explanations with lively interviews and surreal musical interludes. 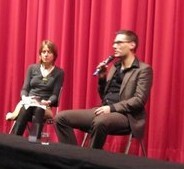 After the film, moderator Isabel Cole began by asking Benjamin Scholz for his own assessment of the fracking technique. He agreed that the risks are high, especially when transparency and regulation is inadequate, and also emphasized the issue of efficiency. The technique is extremely resource-intensive, given the immense quantities of water required and the energy needed to power the facilities. What is more, a well’s production rate soon declines and can be kept constant only by frequent “refracking”. In the fracking process, costs and risks are externalized. Studies on fracking in the USA showed that 15-80% of the contaminated fracking remains in the ground, and that the water brought back to the surface cannot be decontaminated. And the public has not yet been told how facilities could later be dismantled, the area renatured and the ground sealed. No transparent risk assessment has proven that the technique poses no risk to aquifers, and instruments of oversight are lacking as well. From this perspective, Scholz argued, the technique makes no sense and should be categorically rejected. He emphasized, though, that we can’t do without gas just yet – we need it as a bridge technology leading to renewable energies. Because the sun doesn’t always shine and the wind doesn’t always blow, in future it will often be necessary to offset gaps in the electricity supply. Gas is ideal for the purpose because it can be utilized quickly and flexibly and produces much less CO2 than other fossil fuels. But we must also remember that every technology has its pros and cons. If we put a stop to local unconventional gas production, we must import conventional gas, which has other consequences such as pipeline construction, transport loss and energy required for transport. Scholz argued that in future we will have to move from linear to cyclical thinking. For instance, we could rely on synthetic methane that is produced using renewable energy and CO2 from the air – thus remaining CO2-neutral. Another focus of the discussion was the geopolitical aspect of the international gas market. Scholz pointed out that the “fracking boom” in den USA was inspired by the need to reduce dependency on gas imports. The result has been a global gas surplus, also stemming from the fact that gas demand has been negatively affected by the economic crisis. Liquid gas once intended for the USA is now being exported elsewhere, especially to Europe. One result is that Russia’s Gazprom is losing market shares in Europe. Finally, we discussed whether fracking will be coming to Germany too, as Der Spiegel and other sources have speculated. According to Scholz, fracking was tested in Lower Saxony as early as 2008. The German Greens have already launched two parliamentary initiatives calling for increased regulation of the technology, but the Federal Government responded that the responsibility lies with the mining authorities of each individual state. Also, an environmental impact assessment is required only for wells above a certain output – and as unconventional gas drilling involves many smaller wells, there is a risk that these wells will go unregulated and that the public will be excluded from the process. But one positive difference to the USA, he pointed out, is that so far unconventional gas drilling in Germany seems to be confined to shale gas. In the USA, fracking is used to extract both shale gas and coal seam gas; coal seam gas lies closer to the surface, and closer to aquifers. 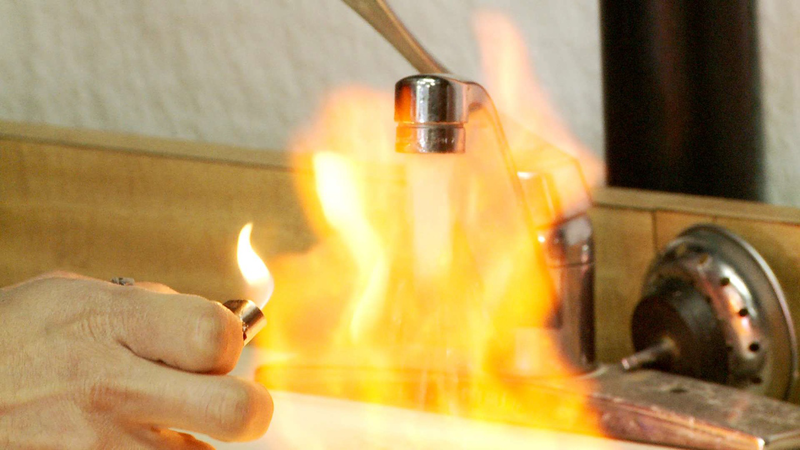 Shale gas is found much deeper, posing fewer risks for groundwater. Scholz speculated that in Germany coal seam gas is regarded as too risky. At the same time, he encouraged audience members to inform themselves and take action, for instance by requesting parliamentary initiatives from the political parties or directing inquiries to the Federal Ministries (Economy/Environment), the German Research Center for Geosciences in Potsdam and the Federal Institute for Geosciences and Natural Resources (BGR). Thanks to the One World Berlin Festival for the chance to engage with this fascinating film, and to Benjamin Scholz – and the audience – for a very interesting and informative discussion! Interview with “Gasland” director Josh Fox in The Nation. “Shale Gas: A Game-Changer with Implications for Europe”, paper by Maximilian Kuhn of the Environmental Research Centre (FFU). Thanks for the links! Very interesting to hear about these initiatives in Germany.